Helsinki's 'pain' festival as I was told the name translates into, goes all the way back to 1998 and has seen a yearly growth in the number of attendees and also the quality of bands that performed on its stages. The 2011 edition (22 - 24 July) was the first one held in a new location, called Suvilahti, a former industrial area by the way it looks, with less vegetation but surrounded by factory buildings which had their advantages at times. The Finnish weather was incredibly friendly for the three days and except few minutes of rain, we were greeted by a lot of sunshine. My biggest positive surprise at this festival comes from the people, especially the employees/volunteers working as guards or serving drinks and foods. I've never seen so much politeness for the whole duration of the event. Everything was handled with a smile and when possible a joke. No matter if it was to give you directions or to kick you out of the area. Everyone was incredibly helpful and contributed to three days of perfect mood. Also when it comes to people I can say I've never seen so many 'extreme' outfits and haircuts per square meter. If you will take the time to go through the photos of the crowd you might understand what I mean. There were 4 stages that hosted 51 bands for the weekend. 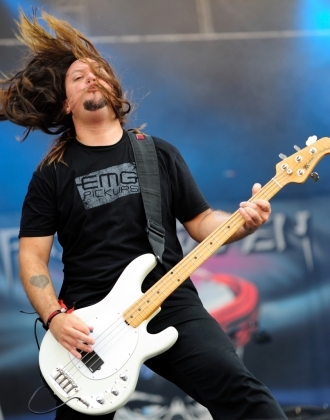 On Friday, the main stage was opened by San Francisco Bay Area thrash band Forbidden, who, despite originating at the same time as Death Angel or Exodus, didn't gain as much popularity due their very long absence. But they were the perfect festival opener in my opinion as they play a clean good old fashioned thrash that easily sets you in the festival mood and lets you know it's time for good music. I loved how the voice sounded and the engagement of everyone on stage. A lot of their songs were from the fantastic 2010 album, Omega Wave, but I heard people cheering when older titles were announced. Following my friends' recommendation I went to the Inferno stage, the one in the tent, to watch the Brits from Hell. I was in for such a funny treat from the heavy metal band who was formed in 1982 but only released one full length album so far. Their stage show included white face paint, bare chests, very funny and expressive figures and British humor in between songs. Songs that had this interesting quality of not sounding too much alike, but having a common line altogether. It was like a very modern theater play with a wicked minded director. To continue in the style of dead waking music on the main stage, the Swedes from Arch Enemy performed next for about one hour and I was actually glad to finally see them so close. I only recall seeing them at another festival from outside a fully packed tent. And what I heard then was confirmed now: the incredible voice of the tiny Angela Gassow who probably intimidates half of the male singers in today's metal. Everyone's stage experience, but also the fact that most of the band members have several other projects is obvious in the quality of their instruments performance and having some really cool solos, be they improvised or not. 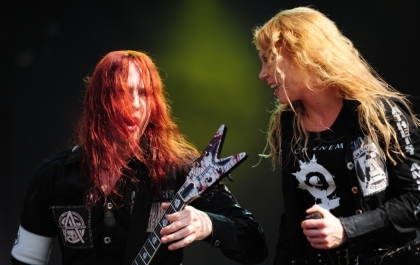 Actually I saw the guitarist Michael Amott and bassist Sharlee D'Angelo perform few hours later together with Per Wiberg of Opeth. This time with their stoner/hard rock project called Spiritual Beggars. A cool groovy sound as I recall, but unfortunately, the rest of the afternoon was very affected by the news I got from Oslo about the bomb attack and all. So even if I went to see 3 other concerts after Arch Enemy, my mind was elsewhere. Therefore I find it hard to write too much about At The Gates or Morbid Angel. I recall hearing nice melodic parts in their death metal and both bands have frontmen that are loved by the crowd and know how to set the right mood. A plus for Morbid Angel for the fact that they did not insist on playing too many tracks from the controversial latest release, "Illud Divinum Insanus", to the delight of many fans.